Home » Crafts, Sewing, & Home Decor » giveaway post » Unloading My Crafting Stash on all of You……..Merry Christmas!! Unloading My Crafting Stash on all of You……..Merry Christmas!! If you were having problems finding/downloading the pattern pieces from the snuggly owl tutorial I shared with you yesterday (found here), try it again today. Bernina let me know it should be easier to access today. Click here for the full tutorial over on Bernina’s Sewing Republic. I love to make new things. But sometimes the pile of new things grows and grows…….and never gets put to good use. I usually have a purpose for whatever project I’m working on. But sometimes I change my mind, sometimes my gift idea for a particular person suddenly morphs into something else, and sometimes I just wanted to see if I could make something, well, just because. The end. And what happens to those little projects? Well, they just sit. And wait. So why not unload several of them on you……….right this minute? The only bummer in all of this, is that I won’t be able to hand deliver them to you…….or give you that little I-think-you’re-great squeeze. Or chat about life/traditions/Dr. appts/local sales/new recipes/funny moments……..like I’d like to. Bummer. So, here are a few things that have piled up………..
………..that I’d love to mail out to several of you. Hopefully in time for Christmas. But no promises. Whew, that’s too much pressure. Most are pretty simple little things……..but all would be so much happier with several of you. A cozy flannel scarf……with several lovely ruffles at each end. Well, actually 2 of them. One in a gray blue and the other in a vivid red. 2 of you will be receiving one of these little lovelies. 2 gift card cozies……ready for sliding a gift card in, and then gifting to someone else. Remember, I made a set of three cozies in this post? Well, I gave one away but have 2 remaining. Need ’em? One person will get both. Maybe one of you would like this little sling purse, made from a sweater (tutorial here). It will feel much more loved with one of you. And hopefully that cheery little flower will put a little kick in your step. It’s a snap closure and no pockets inside. Super basic. How about one of these little zippered pouches (tutorial here)? Do you have just the need for one of your very own? I will send these out separately…….and share the love with 3 of you. They really could be used for anything……..craft supplies, make-up, jewelry, treats, pens/pencils, etc. Hmmmm……..who’s in need of a new purse? Here’s the completed Darla Purse (made from my Darla Purse pattern found in my shop here)……….that really just needs some love. She hangs in my craft closet, waiting for the perfect new owner………and the time has come. There are two velcro pockets on the inside and a snap closure. And by the way, the main body of the purse measures about 15 tall x 18 inches wide at the base. And for those of you who like to sew……..a few patterns. Just thrown in for fun. 5 of you will receive a pattern (of your choice) from my shop. So not the actual items…….just the PDF pattern, that will be sent to you through email. Most include over 25 pages of very detailed instructions and photos. All patterns choices can be found here. That should clear out some space for me. I really wish I had something for you all. Because I really do have a ball with this site and appreciate you stopping by. You readers are what makes this crazy blogging thing fun for me. Seriously. Then the fun part for me. Tell me something, anything. You know, like you’ve just plopped down on my couch, ready for a nice chat… Share with me your fave YouTube video, your favorite flavor of toothpaste, what your child wants for Christmas, how far you hiked the other day, how you like to cook your turkey, what your favorite type of candy is (snickers…no, cinnamon bears…no, cadbury mini eggs……Yum! ), what makes you most happy in this world, how you got that stain out of your carpet, etc. Really, just tell me anything…..no stress. That’s it. Just one comment per person……..with your choice of item, your email address, and little something to share. Not sure how to leave a comment? Make sure you are at the Make It and Love It site (not reading from an email or google reader) and scroll down to the bottom of the post. You will see in smaller print, “Posted By Ashley”, then a time, and then the word “Comments” with a number by it. That number signifies how many people have left comments. Click on the word “Comments” and a new screen will pop up. On the right side, there is an empty white box where you can leave a comment, enter your info below it, and then publish your comment. Your comment will appear at the bottom of the list of comments. That’s it. This is a quick little giveaway…….so it will close by Sunday night (Dec. 19th) at midnight, EST. Only 2 days from now. That way I can hopefully drop them all off at the post office on Monday morning. Thanks for sharing……and thanks for de-cluttering with me. Amazing, I may be the first to comment. My first choice would be the cute red scarf, but I really do need a purse. Easy to please. Now the fun part – My favorite part of Christmas is snuggling up with all four kids and the hubby reading Christmas stories around the lit tree every night. Something fun – here in VA we got snow yesterday (VERY unusual for this area!) which got me out of work and I got to spend the whole day cuddling, playing, and crafting for my little one on her 6 month birthday! And we're out again today! I'm off to cuddle some more until nap time, then maybe I'll tackle something with zippers… or not! Those scarves sure look cuddly. I'm all about keeping warm! Of course, I have a million uses for zipper pouches too. My 11 month old wakes up with me every morning – no matter the time. But not this morning, I have a few minutes of hands free quiet to get a few things done! I'd like to wn the brandley booties or tie pattern. I'm finally finding that I have a little extra time every now and then and could start sewing some special stuff for our little dude! Now for the fun part… I dreamed last night that he started walking and pulled down the Christmas tree…. eeeek! Hm…couch talk. Let's see. I've been attempting to run this holiday season and I have been going 2 miles everyday so far. That's all I have to do is 2 miles. If I feel like going farther, that is fine, but I must do 2 miles. Then I don't feel as guilty about the fun holiday treats. Ohh, it's so hard to pick just one. But I have really loved that sling purse ever since you posted about making it the first time. LOVE it. I'm in love with the scarfs… I like the blue one.. but the red one is just as amazing. I love to Jazzercise. Even though I'm in my 20's. Very generous giveaway! I love the pouch with the dress forms on it! A little about me…hmmm…this holiday season I have spent every evening after the kids go to bed re-decorating my tree with all the ornaments the little buggers take off during the day. I love the sweater purse! Something fun–I got to go shopping alone yesterday evening, no kids!! Those Abigail booties are so sweet! I would love to try to make some for my daughter. The only time I allow myself to read blogs anymore is during our middle of the night feedings, so I'm most likely to read between midnight and 5am. What a great idea! I love the scarves and the sling purse. I'm amazed you have finished projects lying around! I'm very afraid that Santa will be disappointing my 3 year old this Christmas. All she is asking for is a REAL unicorn! Oh wow, I would LOVE one of the scarfs, the Darla purse, or a pattern…..too many great options! All of your things are lovely! I'd most like the red scarf or any of the bags! I heart bags! I would love the sling purse. The splash of color on the inside warms me up on this cold morning. I am actually sitting on the couch reading but I am also anxiously awaiting the end of today-last day of school- so I can concentrate more on my crafting and cooking. I'm tired of grading papers. I would love either the Darla purse, sling purse or any of the patterns. Fun thing to do, we like to go see the lights on the lake. One of the lakes in the city puts on a beautiful holiday light trail. It's miles long, you take your time driving down the parkway. I think that I would like the scarf or gift card cozy… or maybe the purse… obviously anyone will do! I secretly want to write books for children! I LOVE that dark grey zipper pouch with the yellow flower! Patterns are always great too though! I love the Darla Purse. So cute!! I am so ready for a vacation next week….I really need it!! I love this giveaway! wow, what a sweetheart! i too give things away out of my stash of projects… who doesn't love a 'just because'? right now my big news is that movers will be here in 3 days, so all of my christmas shopping is done, done, done! somehow that alone makes the chaos of moving over the holidays a little less, well, chaotic. oh, and my favorite item is the sweater purse. brown & orange?!? oh yes. I love your blog all the time, and I love that cozy red flannel scarf. I am looking forward to Christmas….my 20 year old daughter will be flying in to spend time with us. Then at the end of January, another daughter and her husband and 3 children are coming to visit as well as my mother for her 80th birthday. Then another daughter might come in the spring with her baby. I am so looking forward to all of these visits. I am planning lots of sewing projects for them….Owls for my daughter, nighties for the little girls, stuffed animals and a blessing gown. I am rich…..in blessings!!!! I hope you enjoy all the comments! this is so generous! I would love anything – the purse, gift card holders, pouch, anything! I think everything you make is awesome. As for something random, it snowed here yesterday for the first time this year. My email is sarah.currence at gmail .. thanks for the giveaway! I love the grey/blue scarf but the zippered pouches are also pretty fun! My husband is currently a student teacher and school was cancelled three days last week and three days this week. It's been fun having him around. Kinda like a teaser for Christmas Vacation! This is so nice of you! I am in love with the Abigail Booties pattern. So cute! Lets see, what's happening…oh! It has been in the high 70s in Phoenix. We got rain which kicked the temperature down into winter conditions yesterday, but I think it still might be shorts weather on Christmas. So much for winter wear here! Ha ha! I'd love the red scarf, the sling purse, the zippered pouch (love the one with the three dress forms on it), or the Darla purse. Everything's cute, but those would be things that would make their way to ME! Everything I sew is for someone else! I am heading to Chicago tomorrow to visit family for Christmas. Haven't been home for a year, so it's overdue and looking forward to time with family and friends. Both of our families live there. I love the red scarf &the zippered pouches. Here is something crazy….I have 4 children age 4 and under. Yes, a set of twins in the middle. This Christmas will prove to be a lot of fun with them all! LOVE those scarfs!! And the sweater purse if adorable. I would be happy with any of these little treats. I spent an entire day making "melted snowman cookies" for my daughters kindergarten party. Which got cancelled due to snow. ;( I was really disappointed, but in the end, we ate them at home and they are very tasty! I would love the scarves! But anything here is really cute. You can let me know I won by e-mailing me at jnfr1 (at) hotmail (dot) com. I'm a teacher – and wishing Christmas break started after today, but alas, we have two days of school next week. I'm just like the kids— let's be on Christmas break already! How adorable! Thank you for the giveaway! I am in medical school, so I take time on the weekends to de-stress by crafting and baking. I am currently making tons of slippers out of old felted sweaters. And I just made some rocky road bars that are heavenly! Melt on stove, and then stir in 1 bag marshmallows and 1 large jar peanuts. Spread in a 9×13 pan and then set in the fridge overnight! I would love to win the Darla purse.. something girlie just for me in a house of boys. Speaking of boys, the necktie pattern would also be awesome to win. I am now the mom of 2 boys! We have a 2 year old and we had our 2nd boy on Dec. 2nd. How cute would they be in little neckties! I'd love a scarf, or really anything else for tha matter! My 2 year old is obsessed with the movie Cars. We are currently watching it for what must be the millionth time. Ka-chow. The blue scarf caught my eye…as well as the Darla purse – blue is my color. But we do have a new baby nephew so some of those patterns would be fun too! I'm awake at 5am while the husband drives over the mountain to attend an autopsy for work. I know that's depressing news, but consider it a call to pay attention to friends and family. They may be trying to tell you something. DON'T IGNORE IT, PLEASE!!!!! I would love to win the Bradly Bootie pattern. I am a grandmother to three darling little girls and one more on the way. It would be so fun to have this to make and share the booties with others. It is 6:10 am and I am ready to go teach my early morning seminary class at our church. I am indulging and spending a few minutes reading your fun blog while I wait for my teenage son to be ready to leave with me. Thanks for the opportunity to write. I love all your creative ideas. Wow you are fabulous, I love your blog and often watch eagerly for tutorials. Not sure if this is open to international visitors, but here goes. I desperately need a new purse and or the time to craft one up (though the latter seems unlikely) I love your idea for decluttering, and it is a generous one. I love the scarf and the Darla purse. That color has me aching for Spring! I have to tell you that right now I am snuggled up to my sweet dog…my husband gave him a bath last night and he actually smells good! It's amazing! Thanks for sharing your stash with us! I would love LOVE the red scarf to go with my grey coat. I adore buying shoes- it doesn't matter if I have anything to go with them- I can always make something. I don't even care if they are for me. I heart gifting shoes! I hate thrifting and finding an amazing pair of Coaches in a 6 when I wear a 7.5. It's like a horrible cosmic tease! Thanks for being here- I visit everyday! I really like all of it! The scarfs are so pretty! I am getting ready to head on down to my sewing room to finish up some gifts! I love all the pretty christmas goodness on everyones blogs! I would live a pattern. I just finished sewing my first item, a longall for my 9 month old baby!! I just became a melaleuca customer and am so excited to get rid of all these toxins I have in my house and replace them with melaleuca products! i LOVE the SWEATER purse! i stayed up all night making gingerbread men cookies for my neighbors and husbands co-workers. I would love the sling purse. I have a tiny one that I use when I go out, but there's not much room for all of my goodies. For the fun part – I just sat down at my desk with a venti skinny hazelnut latte from starbucks, and all I plan on doing today is reading blogs and shopping! TGIF! you are too kind to your readers! i love crafting, but don't have the time to do all the projects i've "collected" in my "wish" files. anyone else feel like that? Well, I am going to my work holiday party today. Hoping to have a blast. Oh, and I love the blue scarf, zippered puches and darla purse.! Is that too much to ask? Doesn't hurt, does it? I love the scarves, and the little boy tie pattern. I'm just learning how to sew, so I'm not sure how I'd do, but I'd love to learn! My not quite 6 months old has 2 teeth, has always been in the 95th percentile, had her first bit of rice cereal last night, and makes me the happiest person alive. I am busy getting last minute christmas gifts made up and just finished 2 village frocks for my little girls to wear on christmas day. Busy, busy! Happy holidays to you and thanks! HI! I would have to say I would love one of your patterns…probably the ties or maybe the sweet shoes…I don't know this is a really hard decision. My little something… I jumped into a runaway car this week to stop it from crashing with my daughter inside…I kinds feel like a superhero. It was all so fast I don't even remember deciding to do it. It was one of those mommy-adrenaline things. It would be so hard to choose. I have 6 grandsons so the tie pattern would be great but my daughter and i spent days trying to create a bootie pattern, before we gave up, so I know the Bradley Booties would be used too. Oooh, how generous! I am in LOVE with the ruffly flannel scarves – did I miss a tutorial for those? I will have to check! Those would make great Christmas gifts – off to look! stephaniewoody (at) gmail (dot) com. My first choice would be either of those cozy scarves, and my second choice would be the Darla purse… so fun! Today is my birthday… and we are celebrating with Indian takeout tonight! I'd love to be so lucky to win any of those, but I think the scarves, namely the blue one, would be at the top of my list! Fun thing – I get to spend the afternoon in my daughter's second grade class throwing a christmas party. I love the sling purse but would be just as happy with the Darla purse. I love scarves & purses! But all of your stuff is so cute! Love this site! Love the Darla Purse!!!! Thank you fr this GREAT giveaway!!! I would love a pattern! But I could take just about anything (including that fabulous red scarf or sweater purse). My little boy (who is just 3 months) has been giggling for his daddy for about two weeks now, and just yesterday he giggled for me for the first time. It just melted my heart. would love either a zippered pouch or a ruffle scarf…can't decide. I don't usually enter many giveaways but I'm sitting here with my 2 sick kiddos…so figured, why not?! I love love love love love the blue gray scarf!!!! It would be an awesome wedding present considering I'm getting married in 3 WEEKS!!!!! I am so excited about getting married- I can hardly wait (also excited about the honeymoon in Mexico)!!! Also- I'm obsessed with hot chocolate right now…with whipped cream on top. Sorry for the randomness but you told me to tell you "something, anything!" fun fact: I am usually pumping while I read my blogs..it makes the time go by soooo much faster! Maybe TMI?? Okay so I have been wanting to purchase and try out the abigail bootie pattern (just had twins and haven't gotten around to it yet) but I also love the brown sling purse. Id love the bootie patterns preferably the girl one cause i have a niece but either would be awesome! I LOVE the sweater purse!!! I LOVE orange fabric on the inside! I hope that my husband gets the earlier flight today. That way he can see the kiddos before they go to bed! Hello! :) I suppose that I have to admit I really love winter. Most people seem to haaaaaaaaaaate winter with all the snow and gray skies, but, honestly, I love staying at home, snuggling up with hot chocolate after playing in the snow with my Sesame and just staying warm! I may also find it humorous to watch my dog attempt to make it around in the snow filled backyard. hehe. :) If I had to choose one of the items…the gift card cozies. They're just adorable and I have a couple to give away! :) Merry Christmas! What a lovely Christmas idea! You get to give presents AND you get more space in your craft room. :) I love that sling purse you made. I have a red sweater in my stash I could use for the same thing, but I'm not a "red" kinda girl. Fun thing? Hmm. Well, we're part of a very new church, and there have been some people interested in participating in a Christmas choir. It's been over 3 yrs since I last sang in one, so I turn into a complete geek, absolutely giddy to get to a rehearsal. I even get to direct the group. I didn't know I'd missed it so much! I would love a scarf. I just moved to freezing cold Michigan and have become obsessed with scarves. I never understood their importance in winter dress till I moved here. So many cute things. However, I think the sweater purse would be my 1st choice. Love the scarves too though!! I adore all of your goodies, but the red ruffle scarf is my fave. I would just LOVE to have that. You are so talented. We had snow in NC yesterday and it was pretty chaotic for awhile until it all turned to rain. Southerners aren't used to driving in snow and sleet, so we don't handle it well! Thanks for the opportunity to enter your giveaway. thanks for the wonderful giveaway. I would choose either of the booties patterns as I have two new grandchildren arriving next year. Or the pretty green bag pattern (for me). My favorite part of x-mas would be Christmas eve late at night and just relaxing with the family. I would either one the red scarf or one of the adorable zippered pouches. TOO CUTE. Samething about me — I wish I could sew. Oh I love all the beautiful things you are giving away. My 2 choices would be the Darla Purse and the Sling Sweater Purse. I wouldn't know how to choose between them! I would love either the Darla purse or the small pouch with snowflakes or yellow flower. Everything is so wonderful! What a generous giveaway! I would love one of the little zipper pouches or the gift card cozies. And my fun part: I am looking forward to making snowman door decorations tonight with my family. Our Girl Scout troop is delivering them to the Ronald McDonald house, 50 of them for every resident door! I think I'd love a pattern! I'd love to make some little shoes for my 1.5 year old to keep his feet warm . . .
We just moved and I love our new place! So excited to celebrate Christmas here! I love it all. I think the blue scarf and the sling purse are my favorites. Oh, i love all the options! I would love either of those scarfs for sure, possibly the red over the blue, but I'd use either of them a lot! Something fun huh? My parents are flying to see our family this Sunday – this is the first Christmas that they will have visited us at our home since my husband and I got married 6 years ago – I'm super excited! Today is my son's last day of school, I am officially becoming a FT SAHM on Monday! Thanks so much for sharing. I like the zippered pouches. Zippers and I don't get along well. I also like the red and grey scarfs….perfect colors for Ohio State Buckeye fans. OOHH I'd love one of the scarves. Aww what a great giveaway. My child is driving me nuts since he has been off from preschool for the holiday break. I seen his teacher yesterday shopping and asked if I could give him back. LOL.. It's only been 2 days! HELP! What a wonderful way to de-stash :) I am TOTALLY in love with that red scarf!!! But, I really should be putting the Maddy dress pattern in as my wish, because I bought a new (to me) sewing machine early this year, and I am scared of it. I have sewn for years, but this machine is different from my other 2, and I need motivation to unpack (we moved last week) and ring in the new year teaching my oldest to sew. You're so sweet to share your awesome crafts with us! I L-O-V-E that red scarf – definitely my favorite! Something fun: next year at this time my husband and I will be preparing for our first Christmas with a six month old baby. The joy in my heart is really uncontainable…trying to be patient while being so excited, I feel like I'll have Christmas in June! ….. oh and I LOVE the sling purse! I would LOVE to have either of the ruffle scarves! They're adorable! They'll make up for the fact that I've burnt two pots of hot chocolate already this week. I'm so distracted by Christmas! My favorite is the Darla bag…So cute! Although, I would be happy with any of the items!! My e-mail is lindley25(at)charter(dot)net. Now for the "tell you anything" part…today I am heading over to JoAnn's fabric to pick up some fabric to make my hubby some PJ's for Christmas…I haven't made him any in several years and he is due for a new pair. He's getting Gator jammies because he's a big Fla. Gator fan (some of his relatives went there and live near there) and because it matches the Gator quilt I made him as well. He'll be so cute with his jammies and matching blanket. :) Can't wait for Christmas morning!!! Thanks for the giveaway and your MANY wonderful tutorials…I love that you share your ideas with the world! Oh…and I am publishing my comment as anonymous because I can't remember my google account password!!! Can I say how much I have loved simplifying this Christmas? My girls found out about the pink Lego sets so shopping for all my kids was almost a one stop deal (Yay for Lego stores)! They each wanted a pillow pet as well. I've been done since Black Friday and I'm loving it. I am so excited! I love the Darla purse and the sling purse… My little girls love purses and I do too! Let's see,a little something about me, I have discovered a love of homemade candy, my mother in law and I spent a couple hours last night dipping chocolates. It was a lot of fun! Everyone deserves a Mother in Law as wonderful as mine!! What a hard choice! I would probably want the tie pattern or that awesome red scarf! Something fun – I'm still working on making a few Christmas presents…crazy thing is I just started them! Why do I wait till right before Christmas? I can't wait for my kiddos to open them! I would love to have either purse or a zippered bag or a scarf (my oldest daughter would particularly love those) or a pattern (my lil guy could definitely use a lil tie). My daughter (12) was watching over my shoulder yesterday and fell in love with the snuggly owl. We're going to be making several next week during Break (yay for Christmas Break, best time of the year – my husband is a teacher, so he's home too!!) as gifts for her friends and we're so excited. 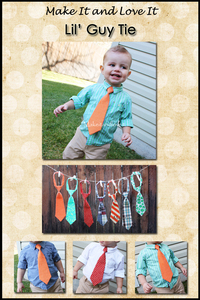 I'd LOVE the pattern for the little boy's tie or your fabulous ruffled scarf! As for random information, my little baby boy Cameron is about to turn one on New Years Day. He was the first baby born in St. Louis in 2010, which was very awesome, especially since he decided to show up a month early! I love your blog. Your ideas are often getting me out of a craft rut! Thanks! I'd love the Darla purse or any of the pattern books. love them all!! beign a florida girl, we dont get much use out of scarves… so we love them most of all!! would definitely choose one of them, or the darla purse… thanks! Love the scarf and the little bags are darling. 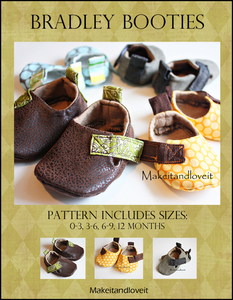 I totally love the pattern for making booties. Those little shoes are just to adorable for words! I am at the office…trying to figure out how I can "disappear" a little early this afternoon. I really am caught up on everything here and there is so much to do at my house! My annual Christmas tea is on Sunday. I need to make food and clean and put some kind of Christmas decor on my front porch besides the wreath. See – I NEED to be home today! I love the sling purse! Santa is bringing my 2 year old a bike for Christmas, and I cannot wait to see how happy he is going to be. All of his cousins have one, and I can tell that he feels left out when they all play together. I love everything, you are so talented. Today I am trying to decide if I should go to the gym or run outside, it is only going to be about 15-20 degrees but I love the fresh air, so if the sun is shining outside it is. oh, blue flannel scarf, i love you. please come live with me. i would be so good to you, and i promise not to let my daughter destroy you. a little something: my daughter, who hates loud noises, was really disturbed by the vacuum that the chimney sweeps used yesterday. when i told her they needed to clean the chimney so santa could get in safely, she told me he could just use the door. now, pick me, pick me! !